So…Is Common Dating Hollywood Actress Laura Dern Or Nah? Because He Was Spotted With Actress Claudia Gerini In Rome! Gotta love the rumor mill! Word on the curb was that Common was allegedly dating Hollywood actress Laura Dern. But, new reports claim that’s not true. Not only that, the Chi-town rapper was spotted getting kissy with Italian actress Claudia Gerini in Rome recently. More inside…. So…do y’all remember those flicks we showed you of Oscar winner Common and Jurassic Park actress Laura Dern grabbing dinner together in L.A. a few weeks ago? Well, the rumor mill caught on fire saying a relationship was budding between the two. We weren’t immediately convinced. The body language in the photo looked a bit off. Well it seems our hunch may have been right. A source close to the Chi-town rapper tells HipHollywood he and Laura are NOT an item. The rumors are not true, according to said source. Another report by US Weekly confirmed Common and Laura were in fact an item and that the “Glory” rapper even met her two children, 14-year-old son Ellery and her 11-year-old daughter Jaya. Hip Hollywood’s source says Common actually may have indeed met her children, but it’s strictly platonic between them. The source says Common and Laura recently shot a film together and were dining out (and possibly meeting family members) on a friendly dinner outing. 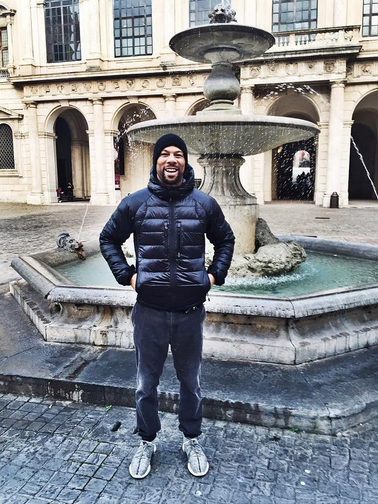 We ran across a few snapshots of Common leaving dinner while in Rome recently (which we can't post here). And he wasn’t alone. He was spotted with Italian actress Claudia Gerini (above), who starred in The Passion of the Christ. As they said their good-byes they looked like there COULD be some chemistry. Claudia tightly embraced Common around his neck as she kissed him. Mmhmm… we see you Common.